There is another kind of black/death metal, which is somehow far different from the usual blackened death style. It's also less known and far less popular. The roots of this uncommon style are leading back to Blasphemy. The better known black/death bands involved the atmospheric influences of ordinary black metal, and their themes are more melodic. Before their appearence Blasphemy created something that lacks all of these features. 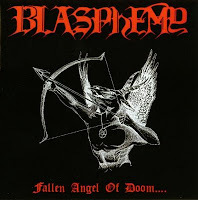 "Fallen Angel of Doom" is a brutal, noisy grinding without any melodies, Just aggressive, disharmonic, blasphemous destruction. That means the death metal influences having the main lead in guitar themes and vocal style , while the simple and ultra fast black style hammering giving the basics. The sound is somewhere between the two. Instead of the impression of a sizzling rehearsal, it's like a rough, low budget studio record (usually it is for real). Sounds a bit cleaner than old school black, but still it's endlessly dirty and noisy. This new approach showed an alternative passage in musical extremity.